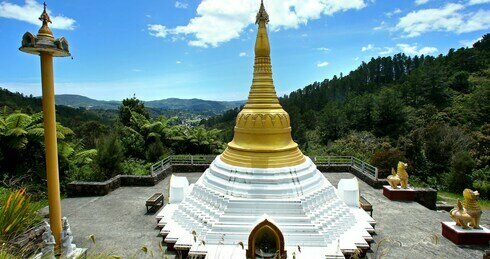 Bodhinyanarama is a monastic sanctuary situated in a 51 hectare (126 acre) wooded valley near Wellington, New Zealand. While principally a residence for those wishing to participate or train in the monastic lifestyle, the large public area and meeting hall are used for religious festivals, public meetings and retreats. The forested area, with remote lodgings, provides a suitable environment for seclusion. The senior monks instruct in meditation, teach Buddhist principles, lead retreats, both at the monastery and abroad. The current abbot is Ajahn Kusalo. Bodhinyanarama is an affiliated Branch Monastery.